Ryan Harrison isn’t just playing tennis in Cincinnati. 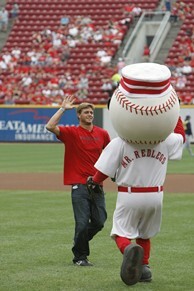 The 2011 Los Angeles and Atlanta semifinalist also threw the opening pitch at the Reds game against the San Diego Padres earlier today. After practicing with the mascots, Harrison was ready to deliver. The American, 19, threw the pitch, receiving applause for his effort. Earlier in the week, Harrison told his Facebook fans about the event. He wrote, "Morning everyone. Headed to the site for an early morning practice and then I am getting to throw out the first pitch at the Reds game today. Going to be awesome!" On a roll this summer, the Louisiana-native, 19, currently enjoys a career-high ranking of No. 76 going into the Western & Southern Open. His ranking received a boost after first advancing to the final four in Atlanta against top-ranked American Mardy Fish, who he lost to in straight sets. The next week at Los Angeles, Harrison again faced Fish in the semis. He stretched the world No. 9 to three sets, losing by a score of 0-6, 6-4, 6-7(3). Earlier in the year, he advanced to the round of 16 at Indian Wells. In doubles, Harrison made his Tour breakthrough by claiming a title on grass at Newport with Australia’s Matthew Ebden. The duo defeated Sweden’s Johan Brunstrom and Canada’s Adil Shamasdin 4-6, 6-3, 10-5. At Cincinnati, he first faces 2011 French Open quarterfinalist Juan Ignacio Chela. Harrison appears in the same section of the draw as three-time Grand Slam champion Novak Djokovic and Andy Roddick, who won Cincinnati in ’06 and ‘03.